"I've got a lot more work to do." NDP Leader Jagmeet Singh addresses the start of a three-day NDP caucus national strategy session in Surrey, B.C., on Sept. 11, 2018. SURREY, B.C. — NDP Leader Jagmeet Singh kicked off his party's caucus meetings in British Columbia by admitting he needs to do a better job of communicating with Canadians and of offering a more generous vision than the Liberals have so far offered. "There is no question about it. We've got a lot more work to do. 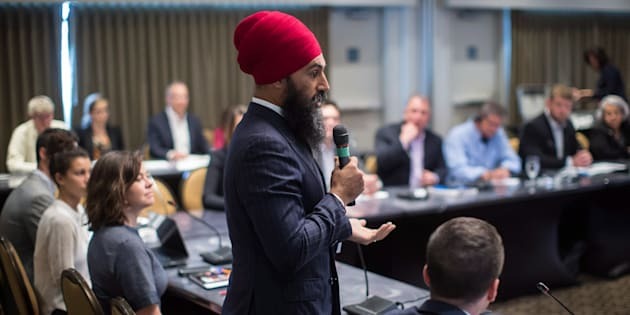 I've got a lot more work to do," Singh said Tuesday, when asked by HuffPost Canada to reflect on his personal failings over the year since he became leader last October. "I've got to do a better job, and our party has to do a better job, of reaching out to understand those problems that people are facing and talking about the solutions." The NDP is running a distant third in public opinion polls, and the party has experienced dismal fundraising numbers and byelection results since 2015. Singh's task over the next year, party strategists say, will be to paint the Grits as elitist and out-of-touch — a branding that fits the same frame the Conservatives have zeroed in on — while at the same time listing what the NDP would do better. Singh got right to that messaging Tuesday, telling reporters Canadians deserve better than the Liberals' commitments on pharmacare, affordable housing, and climate change. The Grits' pledge to study pharmacare falls short of what people should have, the NDP leader said, which is a universal system that covers everyone and reduces cost. "Not a system that the finance minister [Bill Morneau] is proposing, which will be a patchwork system of coverage [that will] probably benefit his Bay Street friends and not actually reduce costs for Canadians and not provide coverage to all Canadians." Morneau is a multimillionaire who, before entering politics, ran a pension and employee benefit management business, Morneau Shepell, that his father had built. He is married to Nancy McCain, whose family is behind the frozen french fry empire McCain Foods Ltd.
Singh carried the message into the caucus room where some 30 New Democrat MPs were gathered to help set the party's fall agenda in the House of Commons. Wielding a handheld microphone and occasionally reviewing his hand-scribbled notes, Singh told them the Liberals are not prepared to close tax loopholes that benefit the ultra-rich. "It shouldn't come as any surprise if you follow the money," he said, noting that the NDP had recently crunched the numbers and learned a majority of the country's top 100 richest people had donated to the Liberal party. "Fifty-six percent of the wealthiest Canadians, or the richest Canadians, have donated to the Liberal party," he said. "And the reason that they've done that is they know, they are confident, that the Liberal party will defend their interests and not close things like loopholes. So, we know where we stand, and we know where they stand." NDP Leader Jagmeet Singh bowls during a social outing with the NDP caucus after the first day of a three-day national strategy session in Surrey, B.C., on Sept. 11, 2018. Later, a press release from the NDP explained that the party had cross-referenced a list of Canada's top 100 richest Canadians, as assembled by Canadian Business magazine, with Elections Canada financial records to spot the Grit donors. The data, which were shared with HuffPost Canada but not independently verified, showed a slightly larger percentage of the country's richest — 61 per cent — had in fact donated to the Conservative party. The Liberal donors include people such as David Thomson, of the $41-billion Thomson family; Galen Weston, owner of Loblaws chain of grocery stores and Shoppers Drug Mart pharmacies; the Saputo and the Desmarais families, as well as James Irving of oil, shipbuilding and forestry family. The Conservatives also counted a member of the Irving family as a donor, John Irving. Other big name benefactors include a Thomson family member, Peter Thomson, Edward Rogers III, Paul Desmarais, James Pattison, the Mannix brothers (Ron Mannix also gave to the Grits), and Heather Reisman (who also donated a smaller amount to the Liberals and the NDP). Her husband, Gerry Schwartz, gave only to the Grits and the NDP, according to the NDP data. Schwartz and Reisman, the records suggest, actually gave more to the NDP, $4,575, than to the Liberals, $3,705. Singh hit on the same themes Wednesday morning when he kicked off another day of meetings in Surrey, B.C. The Grits had stolen from the NDP's playbook during the 2015 election, he said, as an MP shouted "copyright!" Singh responded he didn't mind as long as the Liberals delivered on their commitments. But broken pledges on electoral reform, poverty reduction, and climate change with the purchase of the Kinder Morgan pipeline show they can't be trusted, he suggested. "The Liberals think of getting results for Canadians as more of a public relations exercise, it's got to sound good but it doesn't actually have to deliver results," he said. "You can't lift people out of poverty with a glossy document and slick announcement." The NDP is holding its three-day caucus retreat in B.C. this week ahead of campaign-related events in the riding of Burnaby South, some 15 kilometres away, where Singh hopes to contest a byelection. The current MP for the riding, Kennedy Stewart, is expected to officially resign on Friday when he file his papers to run to be mayor of Vancouver.